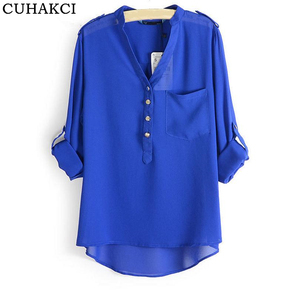 product name factory direct sale chiffon blouse design long sleeve sheer tops female v neck slim shirts style no. A841 Color white,black,green,light pink,orange MOQ 1pc Fabric cotton Size S,M,L delivery time The goods will be sent out in 4days atfer the payment is confirmed. and so on others the more you order,the cheaper the price will be; sample fee will be refunded when customize above 100pcs. size reference photos show about OEM service measuring method Packaging & Shipping 1, We have retailer shop can sell some items in small quantity. 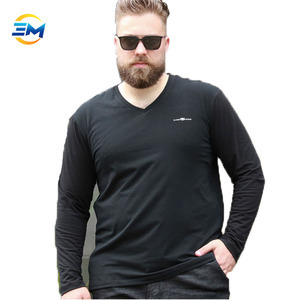 , Ltd Product Black plain long sleeve t shirt deep v neck t shirts for men material Cotton / Polyester Logo CAN BE CUSTOMIZED MOQ 100pcs color various available quality High quality, Low price Style avaliable Various colors and designs at your choose Advantage small order, drop shipping Service OEM Service & Custom Designs Packing pack as buyer's requirement Shipment Sea /Air/Express shipping Delivery time 30 days after orders confirmed size chart pantone card Factory Picture If you have any inquiry or questions, pls feel free to contact with us with trademanager or email. Welcome OEM ! can be customized ! we will reply you asap . the defective products will be select out. 3.Our Promise -Whatever you are new or professional. -Whatever you are big or small buyer. -Whatever you are cooperated or potential partner. Production lead time: 14-21 days after sample is confirmed. c. Final method depends on the weight and volum and personal idea. Samples can be deliveried within 3- 7 days after you make the payment. Every step in the production process must pass quality control inspections. Inspection with every sections and reports offered during the whole production and 100% grantee quality before shipment. Our company is one of the leading apparel series manufactures and exporters in China. manufacturing quality products the first.good product can be to make our cooperation.nice services let us cooperation forever. Alibaba.com offers 37,002 long v shirt products. About 37% of these are ladies' blouses & tops, 20% are plus size shirts & blouses, and 19% are men's t-shirts. 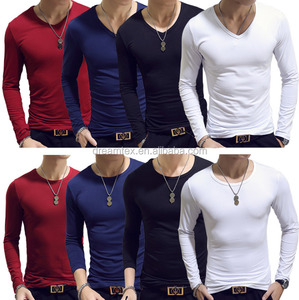 A wide variety of long v shirt options are available to you, such as free samples, paid samples. There are 37,002 long v shirt suppliers, mainly located in Asia. The top supplying country is China (Mainland), which supply 100% of long v shirt respectively. 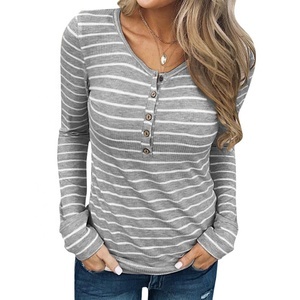 Long v shirt products are most popular in North America, Eastern Europe, and Western Europe. You can ensure product safety by selecting from certified suppliers, including 3,346 with Other, 651 with ISO9001, and 434 with BSCI certification.